It is arguable that insight such as this should permeate the curriculum and not just inform the teaching of English, a subject to which media education often remains annexed. 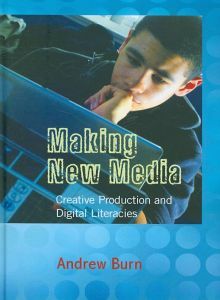 Burn echoes Green’s concerns and argues that it is surely time to use the affordances of widespread digital authoring tools in the service of such an undertaking: yoking critical understanding with creative production to illuminate cross-curricular learning paths, paths that would ideally be pursued throughout the school years and beyond. Burn uses Green’s declaration as a rich source of inspiration for a new theory of criticality: one that subsumes the familiar nodes within and movements around the context-favouring “Circuit of Culture” and the text-favouring social semiotic multimodal framework introduced by Kress and van Leeuwen in 2000. Whilst Buckingham (2003) championed the significance of regimes of production and sought to reassert the non-slavishness of audience interpretation, Kress et al’s object of study remained the minutiae and arrangement of the sign itself. According to Burn, far from being antithetical in nature, “these two approaches need each other” (2009:6), especially in a turbulent socio-economic environment within which material media production as well as access to it, is accelerating and becoming more democratized. He proposes that in order for students to examine media texts, or indeed any text, “with some degree of confidence” (2003b:3), a more “(integrated) textual analysis” (2003b:4) is called for, one “rooted in social semiotics” (ibid). Finally, whilst maintaining the same sense of even-handed caution evidenced in Buckingham’s “Beyond Technology” (2003), I seek to align myself with Burn’s “critical utopianism” (2009:23) which re-visits Williams’ historical perspective, draws together salient aspects of different academic approaches and shines a positive light on media education and ways forward.